I’m in the mood of creating yet another tutorial so here it is, just a simple one regarding reflectors. Reflectors are just as what the name says, they reflect. And what do they reflect? They reflect light. There are many ways to reflect light, different materials will result in different light quality. For example you can use mirror for the most intense form of reflected light, like how someone’s watch that happens to reflect light into your eyes. By using such a reflector, the light would be strong but harsh. I prefer to go with plain white surface, the light is gentle and diffused. Alternatively you can use reflective silver material for something in between. You saw the animated GIF earlier, right? 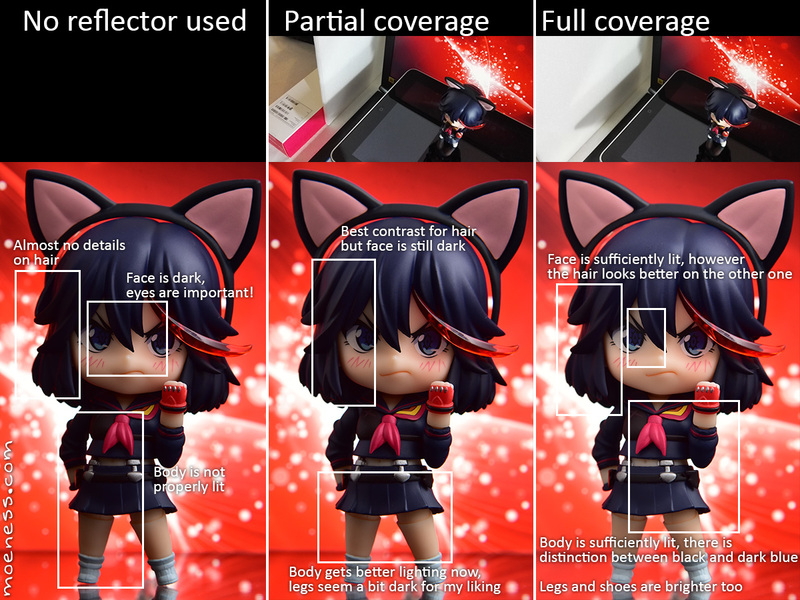 Here are more details on how the images became better once the reflector is used. You use reflector to add light to the subject or scene, when an area is too dark then reflected light helps brighten it. You might be wondering – how about just getting another light source like a lamp or flash? Not everyone can afford multiple light sources and in some cases having multiple light source of the same type doesn’t work for the image. The reflector becomes an indirect light source, and unlike a light bulb or flash the output is different. Which Reflector Type Should I Use? There’s no hard and fast rule, have a few ready and try them out. Remember that a reflector depends a lot on the source light too, if the source light is weak then you don’t have much to reflect then perhaps a mirror could contribute more to the reflected light and vice versa, use a white board when the light is stronger. Reflectors when used effectively, will make your photos look a lot better. Experiment with the types of reflectors at your disposal and choose the best.